UNSMIL chief Martin Kobler today flew to Ras Lanuf for a meeting with Petroleum Facilities Guard commander Ibrahim Jadhran. Kobler appeared overjoyed to meet the controversial PFG leader whose regular closure of export terminals from 2013 onwards cruelly demonstrated the powerlessness of the-then Ali Zeidan government in Tripoli. One time leader of a Cyrenaican federalist movement, Jadhran has since pledged his allegiance to the Presidency Council and the Government of National Accord. In 2013, Ajdabiya-based Jadhran set up a Cyrenaica government with its own cabinet. He also established a Cyrenaican oil company and endeavourd to export a shipment of crude on its account. The tanker Morning Glory was intercepted by US naval vessels and returned with its cargo to Libya. Few details were given of the UNSMIL chief’s talks today but he welcomed Jadhran’s backing for Faiez Serraj and his administration. 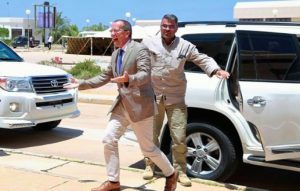 When he had returned to his base in Tunis, Kobler messaged that Libya’s economic recovery and development required security, political stability and unity. It is believed that PFG personnel under Jadhran’s command were responsible for this week’s two-day shutdown of Tobruk’s Hariga oil export terminal.